Description: The foliose phase (gametangial) in the life-history grows from a small holdfast and short stipe to form one or more delicate fronds, flattened and thin. Fronds to 30 cms or more in length branching irregularly and from the margins. The tetrasporangial phase is crustose. Habitat: Epilithic in the lower sublittoral to 25 m.
Distribution: Widespread, mainly western in the British Isles from the Shetlands to the Channel Islands. Europe: the Mediterranean, Spain, France, Denmark, Helgoland, Denmark and the Baltic. Further afield: Canary Islands and Morocco. Similar Species: The tetrasporophyte is crustose and very difficult to distinguish from other encrusting algae. 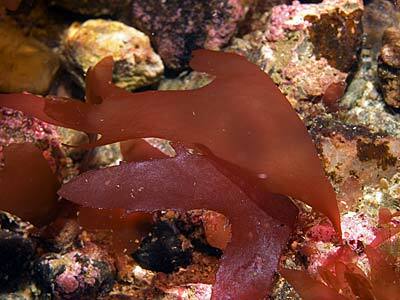 The gametophyte is very similar to Halymenia latifolia and some other red foliose red algae. Delicate flat blades branching irregularly from the edges. Morton, O. & Picton, B.E. (2016). Halarachnion ligulatum (Woodward) Kützing. [In] Encyclopedia of Marine Life of Britain and Ireland.